While a small seaside resort is agitated with the rumour of sharks arriving to its coasts for the first time, Rosina seems to be the only one who’s not worried, even showing empathy for the supposed rovers. Now she takes advantage of the moment to move silently and do everything she wants to do but shouldn’t, as though driven by animal instinct. Los tiburones (The Sharks) talks about being surrounded by many but feeling alone, about what’s hidden beneath the surface, about hot blood, the sea and the irremediable search for empathy. Lucía Garibaldi graduated from the Film School of Uruguay. 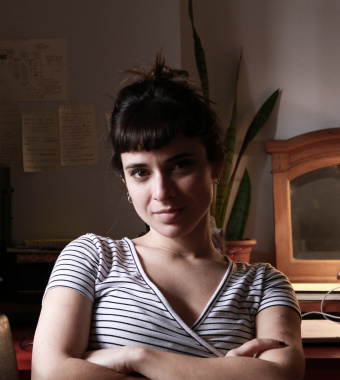 She has written and directed the short fictions Colchones (2010) and Mojarra (2012). Los tiburones, which she directed and wrote, is her first feature film. With it, she participated in the Tres Puertos 2016, Puentes EAVE 2017, BAL 2017, Labex 2018 and Br Lab 2018 laboratories. In 2017 the project won the ICAU Development Fund and the FONA award. She is currently developing the feature films Última reina (fiction) and Mírame, Roberto (documentary).